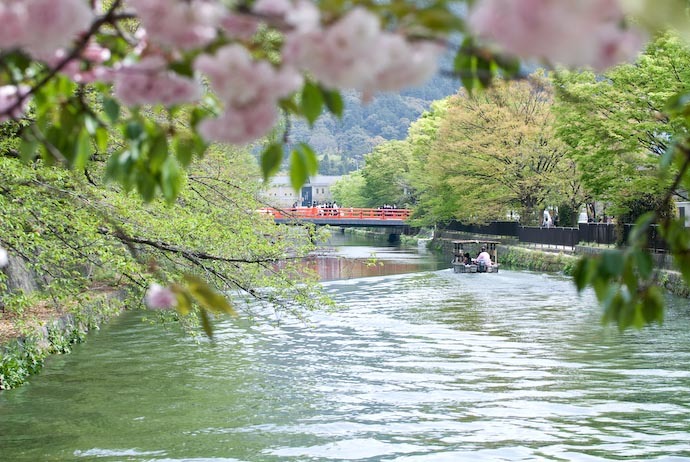 Being March already, I thought I'd look forward to Kyoto's cherry-blossom season, which should be ramping up in to full swing in a month or so. The orange blur in the background of the picture above is the Snowy Bridge from a post week ago. Photos in that post were looking down the canal toward where today's photo was taken. The photos in today's post, of course, were not taken today; they were taken in late April last year after most cherry blossoms in this area were long gone. 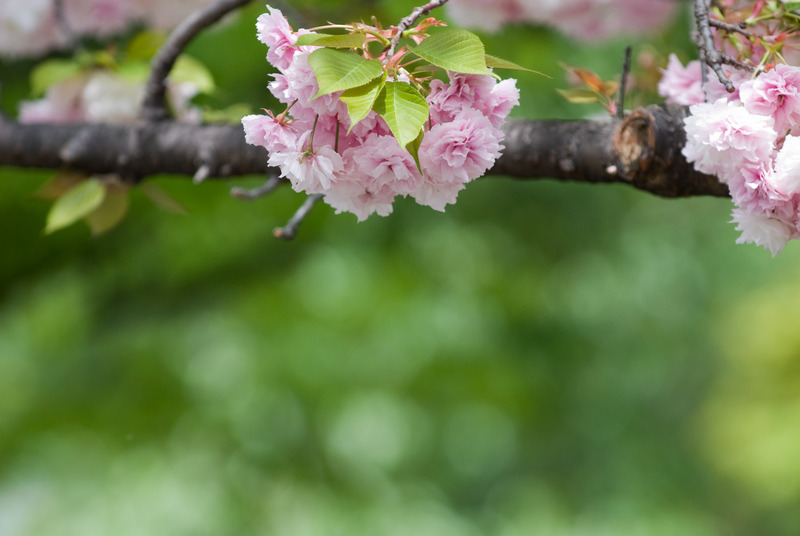 The blossoms here are of a late-blooming variety that appeared on the post 10 Gallons of Blossoms on a 5-Gallon Branch, and also on a hot July's Cooling Off with Pastel Cherry-Blossom Desktop Backgrounds. Picking up on yesterday's Selective Focus post, I thought I'd show a few of the many different compositions that I tried while applying my “carpet bombing” approach to photography. 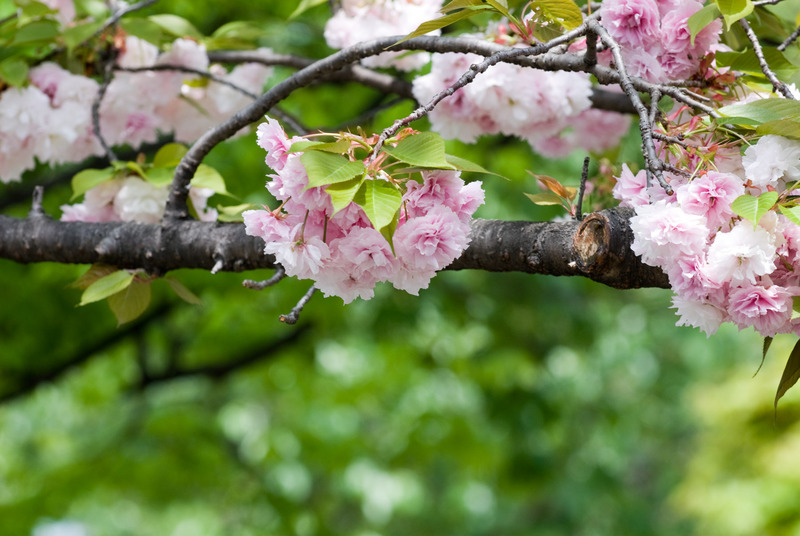 The next two shots focus on the same cluster of blossoms, but the first one has more of the background in focus, due to a smaller aperture and a little less zoom. I prefer the less-background effect, and the framing of that shot as well. In the next pair, the exposure settings remain the same, but the point of focus shifts from the foreground to the background. I suspect that the first one leaves too much to the imagination when you don't know what the background scene is, but once you do, I prefer it to the second one. The boat, by the way, is one of several cherry-blossom sightseeing boats that ply the canal during the spring when the canal is lined with cherry blossoms (as seen here, and in one of my first posts several years ago, here). I still have my best “snow at the Heian Shrine” photos to post, and the current forecast if for more snow early next week, and with all the snow that's been in my blog lately, I thought today would make for a nice change. First of all I want to say that I am so amazed over all of the pictures you put up here on the Cherry Blossoms.. They are truly amazing….Really makes me wish I was there. Got most of the pictures saved down on my computer and in a rotation of them as wallpapers. They are so beautiful.. I was browsing Google images for some springtime pics for my desktop and found you. 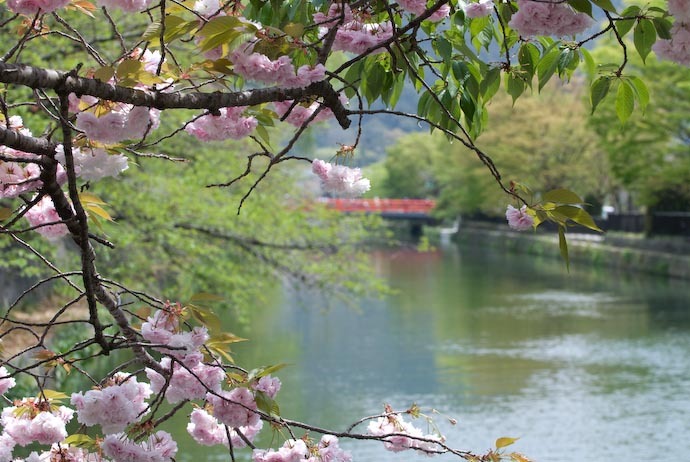 I used to travel to Japan extensively and your photos bring back so many incredible memories! Especially a glorious Sakura Festival in Kyoto years ago. Those “cotton-candy” type are actually my least favorite kind of of cherry blossom. I like the more delicate ones. Great use of the 70-200, though. I’m with Zak in preferring more modest cherry blossom, preferably not these florid double-flowered ones, but once again, you’ve helped us think about another aspect of composition. I now realise that I tend to think of composition in only two dimensions, but these show how important is the third – depth. 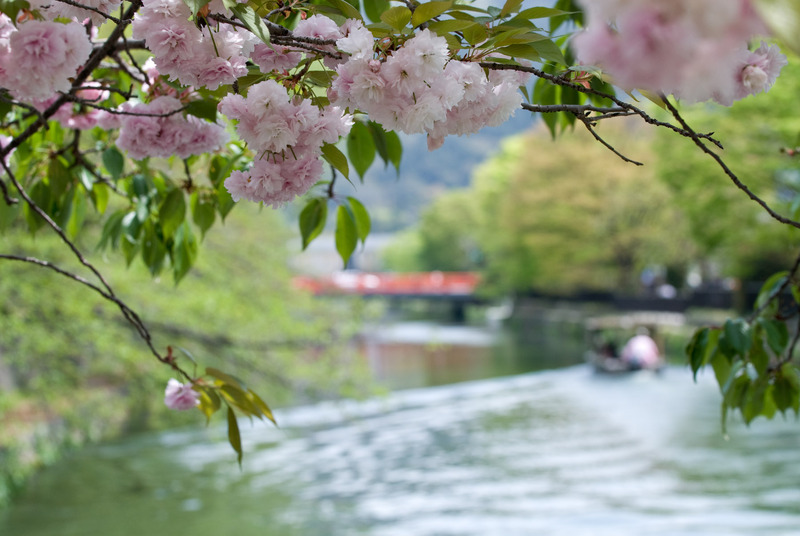 The two cherry blossom-with-boat shots fascinate me especially. I suppose the fact is, they are two different subjects, even though the framing is identical – that’s clever! The first is a portrait of the cherry blossom with the background providing some context; the second is a shot of the river, with the cherry giving depth as well as a frame. Intriguing. By the way, Jeffrey, I’ve succumbed to a LCD flat panel display – and love it! The old CRT has its uses still, when I want a dual monitor display.